This is my self-generated super map thingy - you can download it here, or make one up yourself even easier I suspect. The arrows fairly self-explanatorily show where the troops moved during the game. At some point I will do this as an animation - but not this tourney (so relax, you are safe). A table with dunes and some other rubbish (actually, nice dunes from Nik to be fair) saw me take on Nik Gaukrogers Hamanids. With a new camera deployed by the Pharoh, getting the correct setting for the white balance under the tricky conditions of the hall was proving difficult to nail down, so apologies if some of the pictures are somewhat iffy with respect to the colours. But the tablecloth looked great ! The game started with a strong wind blowing kinda towards me. My bow/blade blocks, unused to playing with weather, and seeing only squishy stuff in front of them advanced confidently into the strong wind. 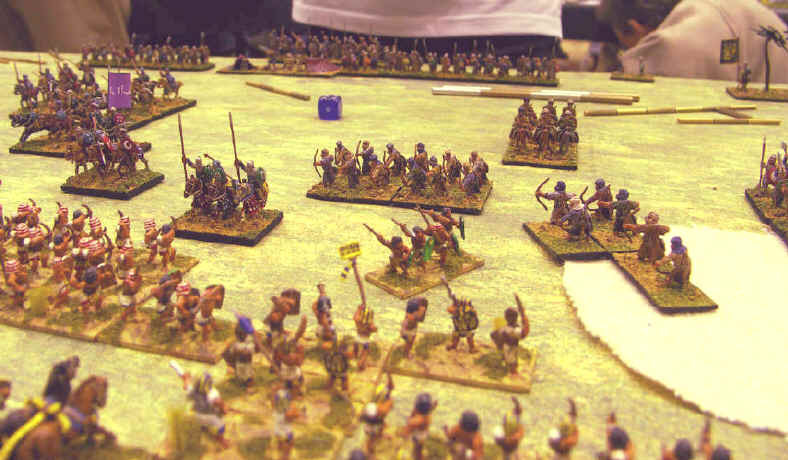 Confident as my bowmen were, the Arabs were still more confident, and had visions of earning a delayed entry into Heaven for their Cavalry by succesfully riding down the bowmen in my CinC's command - yes, the block of 8, with their natty red hats..! Niks cavalry closed to within bow range, and looked happily at their probability tables. Cv (S) - or even 2 ranks of Cv (O) - vs 2 ranks of bowmen into a wind looks very close to a de-facto 2-2 (3-1(extar shooters)=2, vs 4-1(wind)-1 ("S")... all works out at a 1 in 9 chance of being sent to martydom. But the Egyptians were reading the same numbers very differently. 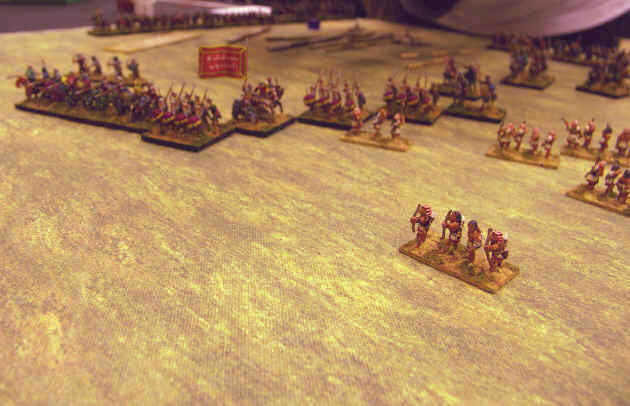 A close on 40% chance of pushing back the cavalry every turn - breaking up an irregular-led formation...and with 8 bowmen, they saw FOUR 1-in-9 chances EVERY shooting turn... which was getting very near to a 50/50 to kill someone each time they shot. And today the dice gods were with Rammitupem and the Arab Cavalry started to fall like dead locusts in a sudden cold snap on the banks of the Upper Nile! 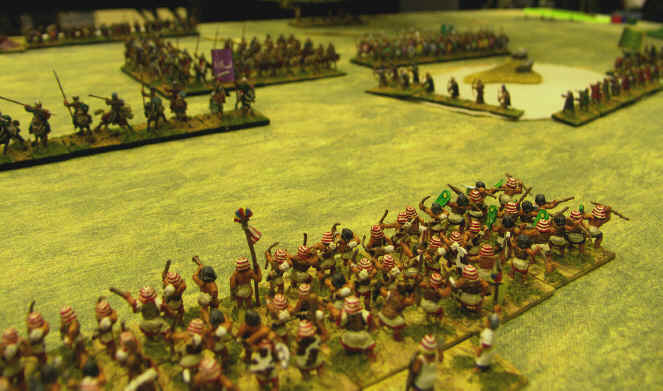 Once a couple had gone, the Arab charge was de-fanged - and the Egyptians started adding an extra 2 vs 1 shot as they were able to gang up on the ends of the Arab line. Without the cavalry to threaten the bowmen, the entire Arab centre began to look like a milling mass of light horse (well, thats pretty much all that was left) only able to stand and watch as the Egyptians fell like Nile Eagles (lying 12th in the Egyptian 1st Division, but have been docked 3 points for a bung scandal) on the soft squish stuff (we hit some of his Bowmen with blades as the daylami struggled to get out of the dunes to protect them). Even my regular Auxilia looked like a good purchase! The Dailami - possibly the toughest part of the Arabs for us to face - were now marooned in the dunes pinned in there by chariots, and now were finding it hard to see a way out as Egyptians pressed them at all sides. The Arab centre was destined to fall. It was written in the sands But, in one last attempt at Martyrdom, the Arabs threw in sacrificial light horse into the red-hatted Arab bowmen. With out overlaps they fought, at worse factors than their more noble cavalrymen brothers, riding over their stinking corpses to sacrifice their lives for, erm some bloke with bleached hair who works for the YMCA. Of course, they did far better than the Cavalry would ever have managed. 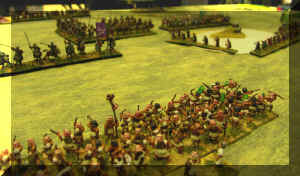 In taking down the Arabs, the Pharoh had overextended himself, and the almost demoralized Arabs attack exploded 4 bowmen on contact, dragging down the Egyptian Pharos command even as they themselves died already weakened by the losses incurred from the dead cavalry. 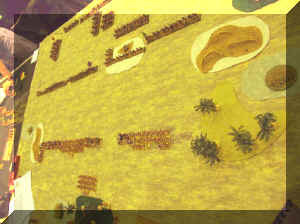 As the God-king fled, there was a huge void in the middle of the battlefield with two broken commands and both the Arabs and the Egyptians found it impossible to exploit their advantages as both sides could only catch dead troops as the clock ran down. For a first outing as an unseeded player this seemed to have gone quite well. I felt the placement of the terrain - especially the dunes with the Daylami behind them had given me a great opportunity to put Niks Irregular army on the back foot with an aggressive start. So it proved, with the Daylami, who I feared could trample my bowmen, being largely out of the game for the duration. The interaction with the cavalry and bowmen was an interesting one - Nik saw it as an opportunity, but I also felt the same, as save for the cavalry the Arabs had little to threaten me. By protecting both flanks of the bow block with Cv (S) and Bd/Ax I had made sure that any cavalry trying to charge me down would be overlapped at both ends of the line, so I was reasonably confident of coming out on top of any exchange. Losing the CinCs command to a last ditch charge by LH was a downer, but then again, I had the rub of the green in the bow exchange prior to it so hard to complain. 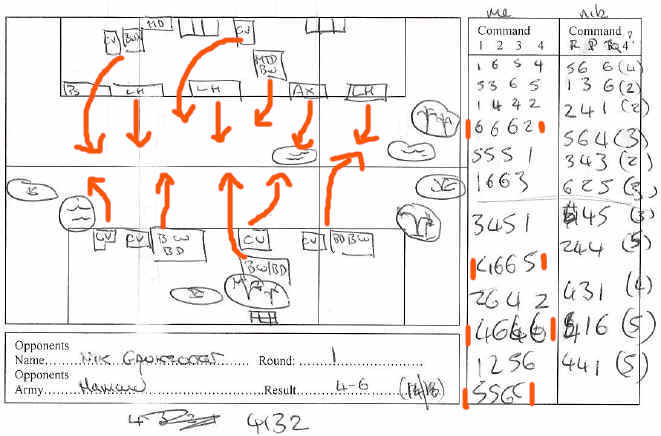 filled the dune with Ax and Ps and fell back with the LH whilst pushing Cv, Bw and Ps at Tim's left forcing him to pull these back as single elements. Tim's C-in-C's Bw shot up a bunch of my Cv despite the wind and so I was forced to send in the LH to try and take down his Bw. This worked and with an element taken down by other troops his C-in-C was broken although I lost my weakened command at the same time. Despite a bit of action after that the score remained as it was and so I picked up a 6-4 (18-14). Bedouin thoughts - again played out as you would expect and exactly how it would have done under 3.0 so no change. NKE isn't a great matchup for the Bedouin when they are handled by a good player who knows how to co-ordinate the Bw, Bd and Cv to effect.